The year 2009 might be classified as the year Barack Obama came down to Earth. The latest NBC-Wall Street Journal poll found that 47 percent approve of the job Obama is doing, and 46 percent disapprove. Those are not exactly Messiah numbers. And that’s the big difference between the public and the press. The media do believe he’s God. Evan Thomas of Newsweek has a way of summing it all up. 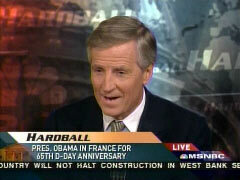 On "Hardball" in June, Thomas explained that while Ronald Reagan was just a "parochial" and "provincial" president of the United States, Obama can lead the whole world. "In a way, Obama is standing above the country, above the world. He's sort of God. He's going to bring all different sides together." After the inevitable furor, Thomas said he wasn’t "being literal." No one thought Thomas was being literal. It would suggest the people at Newsweek believe in God. But all the verbiage surrounding this quote suggested Thomas thought Obama could lead the world into a calm new era. "He's the teacher. He is going to say, ‘now, children, stop fighting and quarreling with each other.’ And he has a kind of a moral authority that he can do that." That’s obviously not true in America, where conservatives continue to fight fiercely against his socialist agenda. It’s also obviously not true abroad, since the world didn’t exactly surrender to Obama’s "moral authority" at Copenhagen. Many Third World countries still hate America’s guts, and always will. The Thomas literary levitation act won him "The Audacity of Dopes Award" for the wackiest media analysis of the year, one of the 17 winning citations in the Best Notable Quotables of 2009, as voted by a panel of 48 expert judges from conservative journalism, academia, and talk radio. Ardor for Obama dominated the entries. The year started with an intensely passionate winter of love around Obama’s inauguration. ABC’s Bill Weir captured the "Coronation of the Messiah Award" when he proclaimed "Never have so many people shivered so long with such joy. From above, even the seagulls must have been awed by the blanket of humanity." Media liberals seemed almost sad that Obama would have to step down from the comfortable platform they built him on Mount Olympus. ABC’s Terry Moran took the "Barry’s Big Brain Award" for journalists bedazzled by Obama’s brilliance when he asserted "Barack Obama is the first President since George Washington to be taking a step down into the Oval Office. I mean, from visionary leader of a giant movement, now he's got an executive position that he has to perform in, in a way." Perhaps the media will have to just stick with celebrating his legendary coolness. "The Obamagasm Award for Seeing Coolness in Everything Obama Does" went to the fan club known as MSNBC. John Harwood of CNBC almost glowed when President Obama successfully swatted a fly right in front of him during a TV interview. "It was a, you know, Dirty Harry ‘make my day’ moment." As if Clint Eastwood would glare at a fly and ask if he felt lucky. MSNBC’s David Shuster all but waved pom-poms when he chimed in with "An amazing interview...it never fails – great weather, rainbows, incredible speeches, and three-point basket. A fly and he nails it. Unbelievable. Unbelievable." Obama wasn’t the only liberal politician to receive deep bows from the media. The death of Sen. Ted Kennedy prompted The Huffington Post to publish what the judges’ panel found to be the Quote of the Year. Melissa Lafsky, the deputy Web editor of Discover magazine, revisited the death of Mary Jo Kopechne, killed when Kennedy drove his car off Dyke Bridge in 1969 and left her behind. "Mary Jo wasn't a right-wing talking point or a negative campaign slogan," Lafsky wrote. "We don't know how much Kennedy was affected by her death, or what she'd have thought about arguably being a catalyst for the most successful Senate career in history." What did Kopechne think? Unfortunate ly, Lafsky attempted an answer by wondering "what Mary Jo Kopechne would have had to say about Ted's death, and what she'd have thought of the life and career that are being (rightfully) heralded. Who knows -- maybe she'd have thought it was worth it." The Left’s infatuation with Ted Kennedy is so complete that this journalist was actually, and very seriously suggesting that perhaps Mary Jo Kopechne would have wanted to be killed by Kennedy if she knew how her drowning death propelled his career. Never mind the fact that had it not been for her death he’d probably have been elected president, rendering her vision utterly illogical. Just focus on the certifiable ends-justify-means nature of this argument. The liberal mind is a mysterious place. It’s a terrible thing to watch as it wastes.